I have never thought of preserving PMH as a monument. Government sell the site and use the money to help fund the NHS. Thousands of people have new homes. A greenfield site elsewhere is saved. Option B is the clear winner. A victory for common sense. If anything, it was a convenient move. Promise after promise was broken regarding the re-siting of the hospital and the use of the land at Coate. Common sense is NEVER applied where developers of any kind are involved. It's Badbury Park now Unlike Wichelstowe (another site where people didn't want housing development) the houses seem to be going up very quickly now. Still some suckers will fall for it. Mr Muggins (usually sanguine about such changes) and I have a good (albeit bit irritated) chuckle along Tadpole Lane at the pretentious names the developers give their developments. 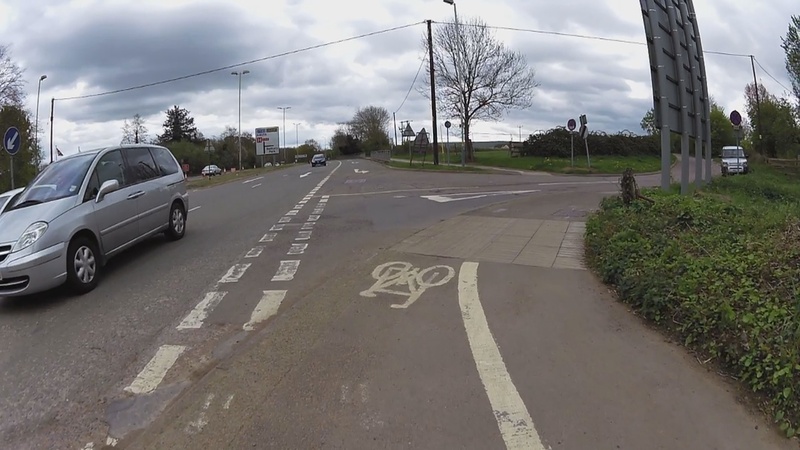 At present they look like a load of dark boxes with white bits and they have totally ruined the line of Tadpole lane, which was a coach road in history and the haunt of the Highwaymen. Now its all twists and turns and posh gate posts, whoever allowed that ought to be lined up and shot. Please tell me Badbury Park is not the final name! Those poor people will think they are living in a village just outside Swindon. It's amazing how people get sucked in, even clever people. Will the people already living at Coate think they've moved. Afraid it is, the roadsigns are up for it and works to Marlborough Rd are pretty much finished. I only drive up there once or twice a month which makes the changes even more apparent. Handy for the hospital and Coate Water though. As part of a much longer ride we rode down Dayhouse Lane, up through Badbury into Chiseldon and down into the back of Coate Water on Saturday. We were both surprised how far the development has progressed and also noticed something else. I'll pull a couple of stills off the video and share them tomorrow. 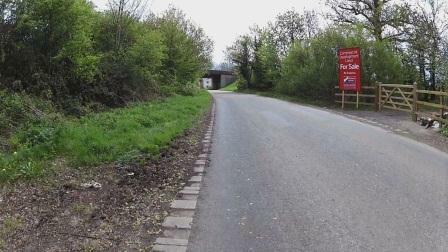 I'll get a better picture of the signs later in the week, but travelling East along Marlborough Road the first 'Badbury Park' sign is fairly large but the second one (which says only 'Badbury Park') is really, really big. Positively shouting at you it is. The other thing we noticed was a new'ish Whitmarsh Lockhart sign, and a nice new gate and piece of fencing, on Dayhouse Lane, just before reaching the A419 bridge. I estimate that the gate opens onto the fields that lead to the back of the nature reserve. Geoff - that last photo for commercial development looks like the area covered in the LDP and planning permission as a business park (employment area). Looks to me like the developers never had any intention to about building a business park, they just wanted to build houses for commuters. Mind you could also shows there's no demand for such units in Swindon, clearly Swindon isn't the sort of place where people want to do business. I suppose 'fill-in' developments were virtually inevitable once the ice had been well and truly smashed at Coate. BTW, when planning a ride recently I happened to notice that Google maps displays the area in close proximity to the field in question as Badbury Wick so I wondered if can anyone share a map showing the place/area names as they were/are before Commonhead and Badbury Park are used to airbrush them out of mind and history. * What say we to a topic split? Tig and I have paused and gandered at the Badbury Park development and think it will be a lovely area to live in. Neither of us agree or support the method by which it came into being but, were we seeking to move into Swindon now, Badbury Park would probably be very near the top of our desirability index. 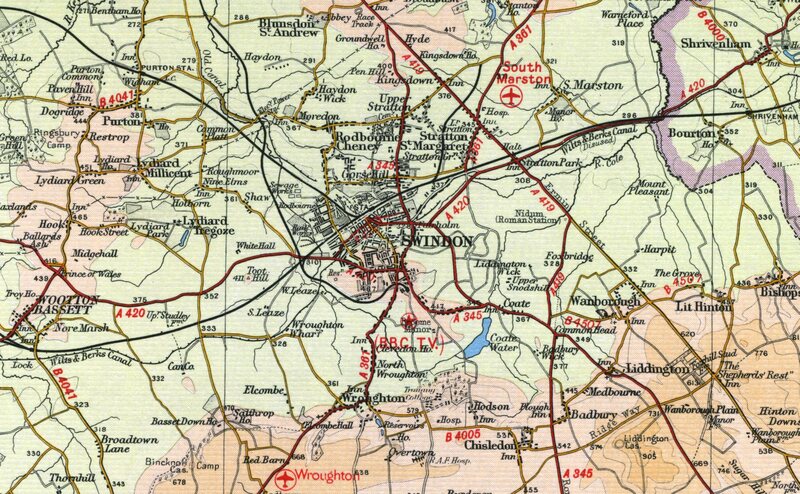 I think this map segment certainly dates pre 1971 (when the M4 was in final construction at Badbury). I'm not sure what others will think but it seems to me that the site of the GWH is closer to Commonhead than Coate, and that 'Badbury Park' is a reasonable name-addition to Badbury and Badbury Wick. I'd still like to see a Swindon map with more detail though. Looks like there was a clay pit and brickworks on or near to the Whitmarsh Lockhart site. Badbury Brickworks, also an area called Green Hill. Looks like there was a clay pit and brickworks there or very nearby. Up until the 90's there were still remains of the brickworks on that site, so historically at least you can argue that bit of land was industrial. Lovely, thanks I love older maps. Confirms that 'Commonhead' has been called Commonhead at least as far back as the 19th Century. I had a nagging suspicion that I might have been wrong in thinking that the area had been re-named to suite development/political aims. Me and Mrs Alligator were thinking the same thing when we drove past recently, however one thing that we both questioned was how the area will stand up to the demand for parking. With GWH not offering anywhere near enough parking for patients and staff we wondered how long it will be before the residents of Badbury Park start to discuss the need for parking restrictions. Until the building work started it wasn't uncommon to see quite a few cars parked along the little side road that runs parallel to Marlborough Road between the Sun Inn and the Spotted Cow pub. On top of that it seems that the "unofficial" catchment area for GWH is growing and that's not just the growth in Swindon, but the demand for their services from areas further afield, so the demand for parking around GWH isn't going to diminish anytime soon. Good point re: Hospital parking. Trying to park at the GWH can be a high pressure affair. I've seen two women exchange unpleasantries and almost come to blows arguing about the parking space I was about to vacate. Page created in 0.743 seconds with 26 queries.